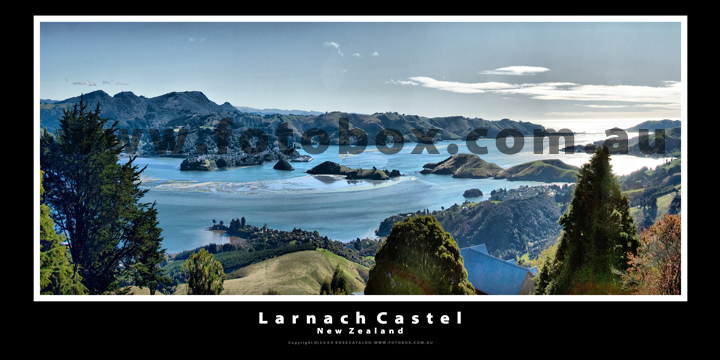 Image Information "Larnach Castle (often incorrectly referred to as "Larnach's Castle"), is an imposing mansion on the ridge of the Otago Peninsula within the limits of the city of Dunedin, New Zealand, close to the small settlement of Pukehiki. It is one of few houses of this scale in New Zealand, and the other one in Dunedin (Cargill's Castle) is now a ruin. For this reason it is often referred to as New Zealand's only "castle". The house was built between 1873 and 1887 as the residence of William Larnach, a prominent entrepreneur and politician in colonial New Zealand. Much of the construction was carried out under the guidance of the architect R.A. Lawson, who was also responsible for many other buildings in Dunedin. The finished house contained 43 rooms and a ballroom, and required a staff of 46 servants. The ballroom was built as a 21st birthday present for Larnach's favourite daughter Kate in 1886. The building, which Larnach himself simply called "The Camp," did not ensure his happiness. After a series of personal and financial setbacks he committed suicide in New Zealand's Parliament Buildings in October 1898. After many years in which the place fell into disrepair, it was bought by Barry and Margaret Barker in 1967, and has been restored. It affords spectacular views of the Otago Peninsula and Harbour and is 10 kilometres by road from the city centre. The house and its grounds are regularly open to the public. The gardens were recently awarded "Gardens of International Significance"."